Click on section headings to open and close the photo menus, click on camera icons ( ) to see each photo, and then click on the photos to toggle size. Panoramas are below. 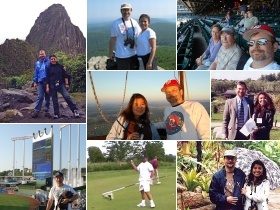 Clockwise from top left: J (Jacqueline) & I at Machu Picchu, Peru in 2003; J & I atop Humpback Rocks in 2010; Connie, Dad, & I at Coors Field in 2009; J & I at Frontier Culture Museum in Staunton in 2002; J & I in Costa Rica in 2005; Dad & I at The Bluffs Country Club in Vermillion, SD in 2004 (double eagle! ); me at Kauffman Stadium in 2011; and in the center, J & I in a hot air balloon near Woodstock, VA in 2008. September: West Virginia, N. VA, & D.C.
October: Staunton, Rockingham County, etc. The hashtag symbol ( # ) indicates photos which are medium-resolution only (600 X 400 pixels); the rest are higher-reslution (1200 X 800 pixels).